Deep heel cup - supporting the heel reduces pressure by redistributing the body’s weight ovwer a greater surface area on the sole of the foot, while stabilising the foot to provide greater control and support. Medial flange - increases control of the medial aspect of the rearfoot. Providing correction, stabilisation and gait training – increasing arch support. Due to thwe level of customisation that is achieveable with the Slimflex Simple, the treatment options with this device are endless. 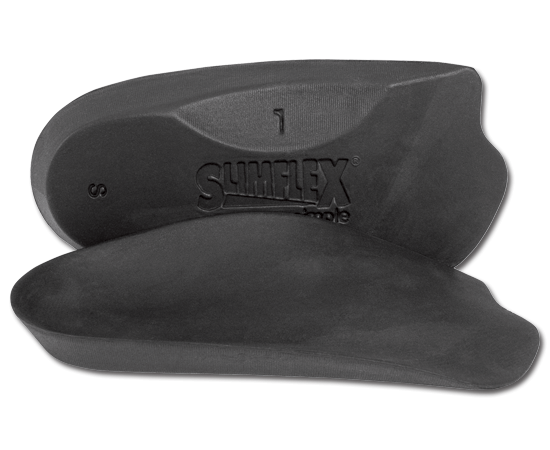 Slimflex Simple is recommended where speed of orthotic turn around is of importance and where chairside treatment is the chosen solution to biomechanical pathologies. Heat mouldable and grindable, the Slimflex Simple allows for quick modification and patient customisation. The flat base also permits posting.